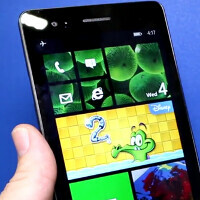 Introduced at Computex on Wednesday is the largest screened Windows Phone device, the Wistron Tiger Windows Phone. The 6.45 inch screen features a 1080 x 1920 resolution, a quad-core Snapdragon 800 processor, and an aluminum build. It does lack navigation buttons and a camera button. This is a reference device that will need to be built by a manufacturer, in order to make it to the marketplace. The 7 inch Android powered Samsung Galaxy W currently is the phone with the largest screen, followed by the Wistron Tiger Windows Phone. The ZTE Nubia X6 and the Sony Xperia Z Ultra both are next, each with a 6.44 inch screen. You can see the phabet-sized device in action by watching the video below. Hopefully, your German is up to speed. Good for you but i will switch from my NL 925 to an android phablet soon possibly the Note 3. No Nokia, No Windows Phone for me. I have to be honest that Windows Phone is a very smooth OS compared to android with the same specs but it does lack of apps and no customization like android. Also, HERE stuffs from Nokia is invalid here so i had to use third party apps which are always annoying by ads. There are many more to complaint about Microsoft for their very slow work like Facebook, whatsapp, and many more social networks. However, i hope it get better soon & i may not give up my NL925 as it is a great phone with a great 8.7MP shooter. Just sharing my idea & hope it doesn't offend someone. And now we know that you are a derp at driving. Any proffesional driving school will tell you speed comes with being smooth. Yes smooth. The people that win races, bar accidents, because they are consistent and smooth and not always the fastest. They do not yank the car about cause you will loose speed, and loose being fast. If you wanna work fast, then a smooth light weight OS that has the ability to integrate into the vast majority of Business functions then the phablet of choice is 1520. Smooth and nexus phones are faster?? Say what? You really need to proof read your comments TROLL tm before hitting send. I second everything you said, especially the "no Nokia, no WP" part. Windows should just give it up along with HTC. Both cant sale, get the point people dont like your products they're no match for samsung and apple. Let Microsoft enjoy WP growing while it lasts. I'm repeating myself again and again, but I don't see people buying non-Nokia Windows Phones even if they had Lumia brand. Agreed! I am using WP because of Nokia, i trust its build quality & expertise only. An estimated 13 million Lumias dold in the last quarter, WP changed software design language, its now license free, more OEM are making WP, they'd be stupid to give up. What window needs is a popular phone, a brand that defines them. Thats what samsung did samsung is the king of android now the galaxy brand is powerful. All these nokia lumias with different numbers is confusing. No i not kidding. Samsungs flagship device right now is the gs5 and the gs5 is a popular device, the rest are just options ex: galaxy zoom, galaxy active, etc. I live in nyc if i stop ten people in street right now they are either going to have apple or samsung those are just facts. Windows is all over the place they need a catchy brand not different phones like lumia 920, 1020. 750, that doesnt help, not to mention the lack of apps these phones have. Look i understand you live overseas but here in the u.s is not a hot device. Giving them away for half price, who wouldn't grab a bargain. Every Oems tried it with Wp before, but it failed. No one wants or likes Wp. Wp sales due to loyal Nokia users. That's why there is 4% share, cause of rest of the Nokia user's have migrated to Linux, leaving a very small amount loyal user's using Nokia, not Wp. Wp would've died, because of Nokia it's still surviving. Giving the samsungs and droids away at half price or free, literally begging consumers to buy a malware infested OS...oh wait thats not what carriers do when they have you buy a s5 for 199 and not 600? Without the mindless drones of sales people shoving crappy droid devices down throats (non flagships) droid would have died long time ago. Apple missed the boat on cheaper devices. BS. Where do you get so much from? Millions have already gaven up and have moved away from Nokia to Linux. They don't care about NokiaWp, but care to be free and have an open platform like Symbian S60. As much as I loved Symbian, it really is outdated. Software-wise it's still among the best but no one makes new hardware for it. The newest and best Symbian device was the 808 PureView and that's mostly outclassed by its WP descendants. I switched from Symbian (a C7 and a 701 most recently) to Windows Phone and haven't looked back, but when I tried android (before I switched to WP) I couldn't get back to Symbian fast enough. https://discussions.apple.com/___sbsstatic___/migration-images/131/13153261-1.jpg Am I doing it right? Why are they not making themselves? same could be said for google? 7'' comes under tablet category?